New Yorker Paul O’Neill was the producer who helped Savatage, a gifted but failing power metal band from Florida, to embrace their progressive side, from 1987’s Hall Of The Mountain King to Poets And Madmen in 2001. Working alongside the group’s ex-vocalist Jon Oliva, O'Neill, who sadly died in 2017, was a vital element as Savatage morphed into Trans-Siberian Orchestra, his experience in the management field helping to bring reality to the group’s elaborate dreams. Talking in Prog magazine nine years ago, O’Neill told your correspondent of a meeting with legendary A&R executive Ahmet Ertegun, who was egging him on to form a band. Though O’Neill wasn’t a performer with TSO, his vision touched everything the band did. With more than 10 million albums sold and having played to more than 12 million people, grossing over $480 million since a first tour in 1999, their success Stateside was staggering. “We spend more on pyrotechnics in two months than all the other rock bands combined do in a year,” he once boasted. O’Neill’s selections are in no particular order. Indeed, the cunning devil loved his progressive rock so much that he tried to sneak in an eleventh selection – The Alan Parsons Project – by failing to number his choices. A good try, sir, but you were rumbled. “In my humble opinion, Greg Lake was the man who invented progressive rock with his contribution to King Crimson, before globalising that style of music with ELP. For a while, during the times when they would play soccer stadiums, ELP were the biggest band on the planet. "At the time, their capacity to meld the classical sounds of somebody like Tchaikovsky with the power of rock ‘n’ roll was cutting edge, though in some ways the band lucked out with Atlantic Records who gave them the money and the room to really push the envelope the way they did. “King Crimson and ELP are, of course, related. Their incredible debut, In The Court Of The Crimson King, was pretty much the album that started it all, and everybody knows that Robert Fripp is the band’s sole ever-present. Members have come and gone but their experiences within the band were priceless. “I like pretty much everything that they do – or did. I love that they found a particular style, a point at which any other band would say, ‘Okay, this is our niche, let’s stick with it’ – and they’d move onto something even wackier. The Floyd constantly experimented with different sounds, effects and instruments but what they took to a whole other level was transforming an album into a live show. "The locking together of those two spheres of music became their essence. When The Wall came out and they announced that there would only be six shows [in America] – three in New York, three in Los Angeles – I considered it a genius marketing move. Decades later, I worked with Floyd’s accountant and raised that very subject. He laughed: ‘It wasn’t a marketing ploy. “Yes have accumulated such an incredible catalogue of music. If you forced me to name my favourite album of theirs it would be Fragile, separated by a hair’s breadth from the live triple, Yessongs. I’m in awe of what the core group of guys achieved, their ever-changing ways of approaching music. “To me, they’re a progressive rock band. Who else in the late 1960s would add a French horn solo to a song? Pete Townshend was one of two guitarists melding Flamenco into his style, the other being Steve Howe [of Yes]. John Entwistle attacked the bass in a totally original style. I always felt The Who were ahead of their time – sometimes too far ahead. "Tommy was such a success for them, there was incredible amount of pressure for the band to do nothing but Tommy. His own manager told him Tommy was bigger than The Who. Nobody wants to feel that trapped. They forced him to turn his beloved rock opera Lifehouse into the album Who’s Next, I sympathised with Pete. And when Quadrophenia first came out, it didn’t even go gold [in the States]. “What a band. They’re out of Canada of all places, and they’re also a power-trio, both of those things are maybe a little surprising. But you know what to expect from Rush – a constant stream of innovation. I’ve seen them multiple times onstage, and they never let you down. “Like so many of my selections, the Moodies were way, way ahead of their time and don’t seem to get the credit that they deserve. When they started out using full symphony orchestras on their records it was way, way harder than doing so in the present day. “One of the most fascinating bands of all time. When Peter Gabriel was their singer, Genesis were such a unique and talented unit. Peter’s going solo caused many, including myself, to assume it was all over. But like a phoenix, out of the ashes came the Phil Collins-fronted line-up. A singing drummer, who’d have thought? "So the two parties split, but Genesis and Gabriel both continued, later heading in a more commercial direction. 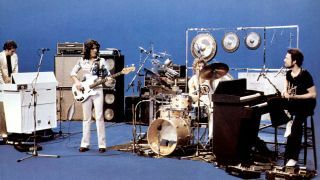 As someone with a keen interest in the staging of concerts, Genesis are also significant to me for their role in the development of the Varilight. Rather than wait around for it to be invented, they helped to fund and design the first automated, variable-colour stage lighting system. “The Kansas album that totally blew my mind was Song For America. The riff to its title track was so hook-laden, and yet the album had so many hidden depths. Some know the band simply for the biggest hit, Carry On Wayward Son [from their 1976 album, Leftoverture], but they were on a never-ending quest for tighter backing vocals and immaculate arrangements. "With TSO we have written songs like Tracers [an instrumental from 2009’s Night Castle] and The Flight Of Cassandra [a non-album track] that were deliberate attempts to create something as musically interesting as Kansas. I’m here to tell you that once a band attains a certain level of success, the machine demands bigger and bigger ticket and record sales. “I was torn between choosing Tull and Focus. Had you told me a band could score a hit with a vocal-less song that included a yodelling section, as Focus did with Hocus Pocus, I’d have assumed you were on acid. I enjoyed and respected some early Jethro Tull songs such as Teacher [from Benefit] but when the Aqualung album came along [the following year] it was right out of the blue.